“Essential History for Global Leaders” will begin on April 9. This class is designed as one of the Doctoral Program Liberal Arts for “Minor Course of Science and Technology for Global Leaders”. The class is open to all master’s & doctoral students who want to be active in the international community no matter which major/minor course they belong to. The lecture will be conducted in English. Pacific histories mainly comprise of voice and memories. Islanders passed their history from one generation to the next through story telling, chanting, dancing and iconographic representation. This course will introduce you to the world of oral history with a primary focus on Hawaiʻi islands and Australia. This liberal arts class welcomes all graduate students with neither limitation to a particular study field, nor high English level. Please join if you wish to learn more about Hawaiʻi and Australia. Undergraduate students can also attend. Hawaiʻi (1): Why Captain Cook died in Hawaiʻi? Australia (1): How aboriginal telling about Captain Cook? 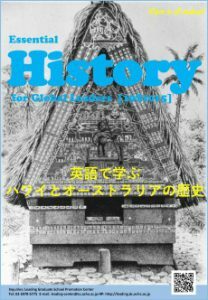 Reading “Islands of History” or any other book related to Hawaiʻi and Australia would enhance your understanding. Marshall Sahlins. 1987. Islands of History. University of Chicago Press. *For undergraduate students, please contact Leading Graduate School Promotion Center.